All kinds of present day harp traditions in all parts of Europe nowadays use a ‘right’ orientation. By this I mean that the harp is placed slightly to the right of the body's centreline, so that the eyes can see down the left hand side of the harp; the right hand controls the treble strings and the left hand controls the bass strings. This is like the orientation of the piano keyboard, with the bass to the left and the treble to the right. By contrast, the Gaelic harp traditions of Ireland and Scotland used a ‘left’ orientation right up until their extinction in the 19th century. The treble was played by the left hand and the bass by the right. This page assembles documentation attesting the Gaelic left-orientation. There are many more waiting to be added. Please let me know if I have missed out any important items. In his 1809 volume2, Edward Bunting published an engraved portrait of Denis O'Hampsey (1695 - 1807). You can see O'Hampsey holding the Downhill harp using a left orientation. This book also includes an engraved portrait of Arthur O’Neill who is also shown using a left orientation. There are a great many illustrations of harpers from the late 18th and the first decade of the 19th century, all of them using this left orientation. Some examples are another portrait of Denis O'Hampsey, a portrait of Patrick Quin, a portrait of William Archdeacon c. 1750. In the 1790s Edward Bunting made an explicit note in his first field notebook, ms29. This is my hand copy of the lower half of page 81 (f38r); you can view a low-resolution facsimile of the manuscript at Queens University website. Direct download link. An oil painting by Reinhold Thimm, dated 1622, shows an Irish harper (probably Darby Scott) as part of a consort at the Danish royal court. He uses a left orientation. View an online facsimile. 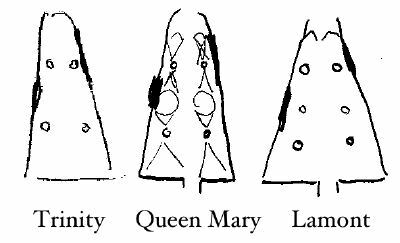 For some insight into other wear from the playing position of the Queen Mary and Trinity harps, see my News Blog. The metal relief picture of David playing the harp from the Shrine of St Mogue (Breac Maedóic), usually dated c.1000AD, clearly shows a Gaelic harp being played using a left orientation. The left hand fingers are cleverly depicted behind the strings in the sculpture.